Jonathan Levi’s exhilarating and complex novel “Septimania” follows an organ tuner and Cambridge graduate student who learns that he has inherited an ancient European kingdom. 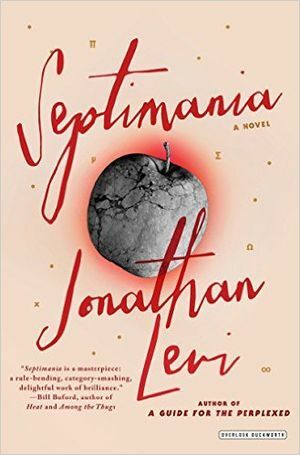 Reading Jonathan Levi’s new novel, “Septimania,” is like dancing on a moving stage; it’s exhilarating, even as you worry that your feet might fly out from under you. Its story careens from one century to another, while keeping two central characters as a touchpoint: Malory, an organ tuner and Cambridge grad student who’s spent the past 10 years avoiding his doctoral thesis on Sir Isaac Newton, and Louiza, a fellow student and math genius who cheerfully takes his virginity, in a church loft, on a sunny March afternoon in 1978. And then she disappears. The author of “Septimania” will appear at 7 p.m. Thursday April 14 at the Seattle Public Library, 1000 Fourth Ave., Seattle. Free (206-386-4636; spl.org). The novel alternates between brief seventeenth-century conversations with Newton and more-or-less contemporary chapters following Malory, Louiza and a handful of other characters, most notably a Rumanian experimental theater director, who offers to be the Virgil to Malory’s Dante — “I will help you find your Beatrice,” he says — and a young woman who may or may not be Malory and Louiza’s daughter. Along the way, real-life history flits in and out, both past and present (the events of 9/11 make a startling, vivid appearance). This dizzying tale is told with a delicate, playful artistry: a kitchen is “bread-warm”; a guitar’s low, slow note approaches from a distance, “like a Ducati along the Lungotevere.” Levi writes especially lovingly about music and math, which illuminate, respectively, Malory and Louiza’s worlds, and hold answers to mysterious questions.